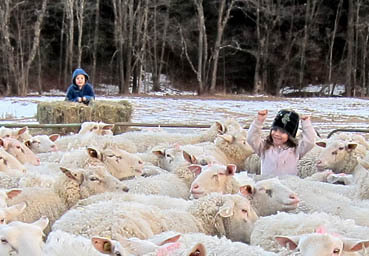 We're a 250-acre farm in Westminster West, Vermont with 300-700 sheep (depending on the time of year), along with shepherds of all ages (and two different species if you count our 8 dogs). At the northern edge of the farm is a Cave which is home to our 2 types of cheese, where they live out the seasons of their lives. Please visit us if you're ever in the neighborhood, and enjoy the cheese!